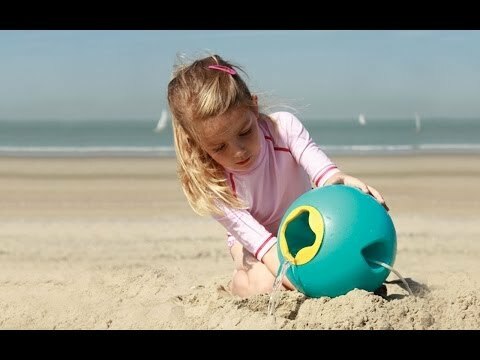 The Triplet Shovel is a unique, multi-functional beach toy: Shovel, rake, water funnel, or sifter. The Ballo Bucket makes it easy for small hands to fill with water, run up the beach (without spilling), and pour with ease. Its spherical shape is incredibly stable, resulting in minimal spills. 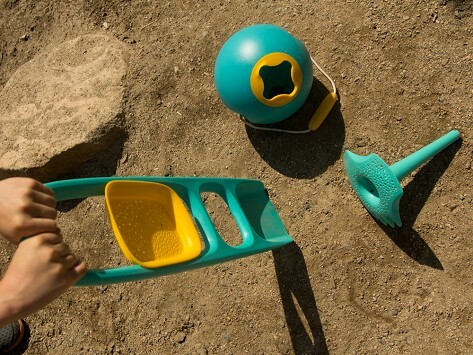 The Scoppi Digger is two toys in one—sturdy shovel and sand sifter. Dimensions: 7.2" x 6.8" x 9.6"
Dimensions: 7.5" x 7.5" x 7.5"
Dimensions: 25.8" x 6.5" x 1.1"
By far the best beach shovel - evah! My family moved to the North Shore of Massachusetts three summers ago and I found the Quut shovel in an independent toy store. It was expensive for a shovel, but I am telling you, the only reason we will ever need to purchase a new one will be if we lose the one we have. These shovels are SO sturdy and SO easy to use. My kids were 4 and 2 when we moved here and they both were able to use the shovels to dig easily and deeply at the beach in all types of sand. Even the adults love it...because although it is fun to dig a hole or build a castle, sometimes you just want to sit down and relax while the kids make their own. As an adult, the shovel makes digging an extremely fast and easy process so you can either build something quick and easy and go back to your chair and relax or something fast and impressive and be surrounded by every kid on the beach. But seriously - regardless of its awesome shoveling abilities (which I can not believe I am saying, but is actually true due to the handle that allows for extra leverage) - nothing on this shovel will ever rust and break off within a month or even a lifetime. There’s no telling what you and your kids can build with sand tools as functional as they are aesthetically pleasing. Sand castle contest, anyone?